Tamdrin Yangtrö Nagpo, ‘Extremely Wrathful Black Hayagriva’, is a Hayagriva practice of the Dudjom Tersar lineage which was revealed by Dudjom Lingpa and later compiled and edited by Dudjom Rinpoche. The emanation of all Buddha’s speech arises as Avalokiteshvara, the form of compassion. In order to tame the wildest beings, Avalokiteshvara manifests as extremely wrathful Hayagriva. In this time of degeneration the inner elements of beings are imbalanced with very strong clinging and passions. Externally, this causes war and the use of biological and chemical weapons. Many new diseases with no known cure appear and epidemics spread quickly. Even friends, husbands, wives, and children seem intent on cheating and manipulating each other, so that no one knows who to rely on. This naturally leads to imbalances in the outer elements. :The water element causes floods, tsunamis, and hurricanes; the fire element causes volcanoes, drought, and heat waves; wind causes tornadoes and windstorms; and the earth element causes earthquakes and landslides. Likewise, all the different classes of spirits become upset. The whole world, whether it is the inner elements of sentient beings or the outer elements, is extremely turbulent and out of control. At times such as this it is difficult for Buddhas, Bodhisattvas and wrathful deities to penetrate beings’ minds. That is when [the Tamdrin Yangtrö Nagpo], this form of Hayagriva in union with Tröma Nakmo, who is the most wrathful and therefore the most compassionate, appears. 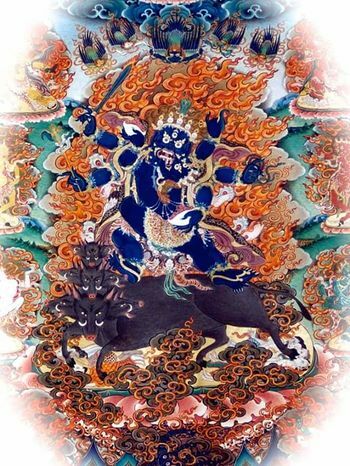 Tamdrin Yangtrö Nagpo, ‘Extremely Wrathful Black Hayagriva’ has special power to affect beings’ minds and benefit those who are depressed, dysfunctional, or crazy, as well as to cure disease. This is the condensed essence of all the billions of Hayagriva practices. It is easy to practice and highly effective. Even hearing this practiced will subdue all classes of spirits. Remembering it will eradicate all wrong views and demonic forces. Touching the image of this Hayagriva will pacify all disease and the passions of the five poisons. For whoever has a connection to this practice the seed of samsara will be destroyed. Padmasambhava accomplished deathlessness through practising Hayagriva. He transmitted it to his heart disciples, Yeshe Tsogyal and King Trisong Detsen to practise and hide as terma. The [Tamdrin Yangtrö Nagpo] was later discovered [during the 19th century] by Dudjom Lingpa who was the emanation of Khye'u Chung Lotsawa and Guru Dorje Drolö in person. Later, Dudjom Rinpoche compiled this whole practice to make it easy to practise. Tamdrin Yangtrö Nagpo is very special, rarely practiced these days and rarely known. On July 16th, 2015, Dzongsar Khyentse Rinpoche granted the Tamdrin Yangtrö Nagpo empowerment to the sangha of Lama Tharchin Rinpoche, in Pema Osel Ling (California, USA). ↑ Written by Written by Lama Sonam Tsering Gyaltsen Rinpoche in March 2015, copyright Vajrayana Foundation. This page was last edited on 14 October 2017, at 13:26.